Ht / Wt: 6'1" / 230 lb. 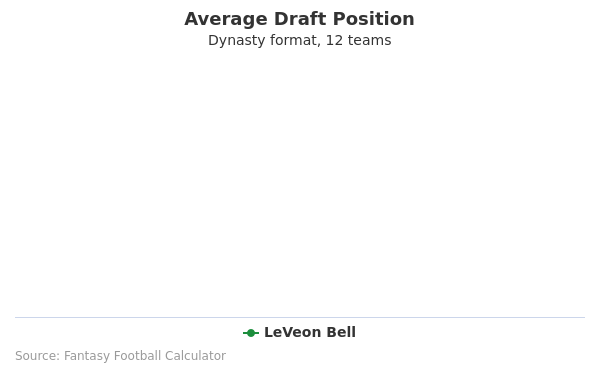 LeVeon Bell's fantasy value is measured by his average draft position (ADP) in fantasy football mock drafts. 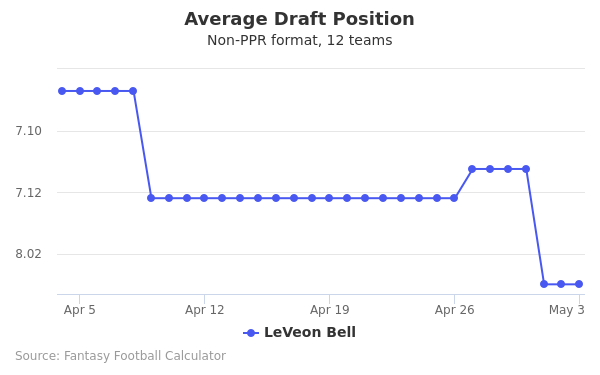 In recent drafts, Bell's current ADP is 1.07, which indicates that his fantasy outlook is to be the 7th pick of the 1st round, and 7th selection overall. 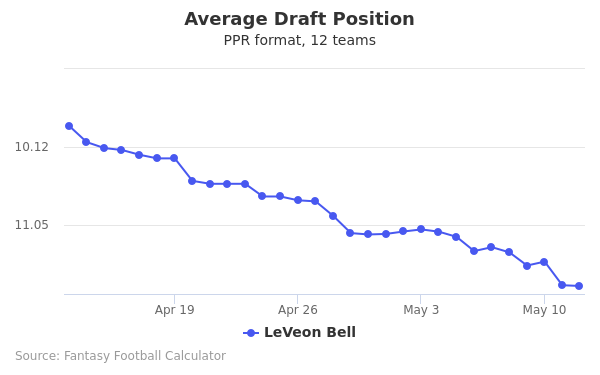 The code below will display a graph that updates every day to show the ADP data for LeVeon Bell for the past 30 days in 12-team PPR leagues. Draft DeAndre Hopkins or LeVeon Bell? Draft James Conner or LeVeon Bell? Draft Davante Adams or LeVeon Bell? Draft David Johnson or LeVeon Bell? Draft Julio Jones or LeVeon Bell? Draft LeVeon Bell or Michael Thomas? Draft Joe Mixon or LeVeon Bell? Draft LeVeon Bell or Odell Beckham Jr? Draft LeVeon Bell or Tyreek Hill? Draft Dalvin Cook or LeVeon Bell? Draft LeVeon Bell or Travis Kelce? Draft JuJu Smith-Schuster or LeVeon Bell? Draft Antonio Brown or LeVeon Bell? Draft LeVeon Bell or Nick Chubb? Draft LeVeon Bell or Pat Mahomes? Draft LeVeon Bell or Mike Evans? Draft LeVeon Bell or Marlon Mack? Draft LeVeon Bell or Zach Ertz? Draft Damien Williams or LeVeon Bell? Draft LeVeon Bell or T.Y. Hilton? Draft LeVeon Bell or Leonard Fournette? Draft Adam Thielen or LeVeon Bell? Draft LeVeon Bell or Sony Michel? Draft A.J. Green or LeVeon Bell? 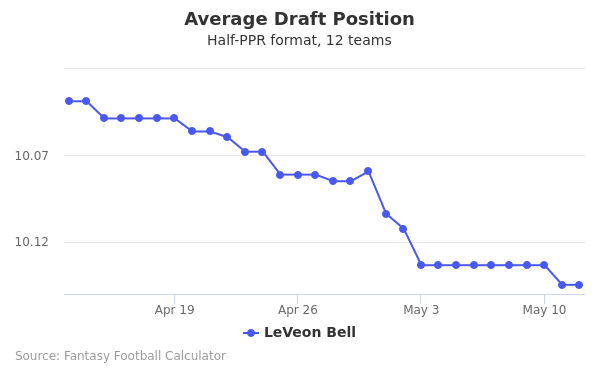 Draft Keenan Allen or LeVeon Bell? Start DeAndre Hopkins or LeVeon Bell? Start James Conner or LeVeon Bell? Start Davante Adams or LeVeon Bell? Start David Johnson or LeVeon Bell? Start Julio Jones or LeVeon Bell? Start LeVeon Bell or Michael Thomas? Start Joe Mixon or LeVeon Bell? Start LeVeon Bell or Odell Beckham Jr? Start LeVeon Bell or Tyreek Hill? Start Dalvin Cook or LeVeon Bell? Start LeVeon Bell or Travis Kelce? Start JuJu Smith-Schuster or LeVeon Bell? Start Antonio Brown or LeVeon Bell? Start LeVeon Bell or Nick Chubb? Start LeVeon Bell or Pat Mahomes? Start LeVeon Bell or Mike Evans? Start LeVeon Bell or Marlon Mack? Start LeVeon Bell or Zach Ertz? Start Damien Williams or LeVeon Bell? Start LeVeon Bell or T.Y. Hilton? Start LeVeon Bell or Leonard Fournette? Start Adam Thielen or LeVeon Bell? Start LeVeon Bell or Sony Michel? Start A.J. Green or LeVeon Bell? Start Keenan Allen or LeVeon Bell? Le’Veon Bell was born in Reynoldsburg, Ohio on February 18, 1992. Raised alongside his brothers by their single mother, Bell’s family struggled financially, though is mother always managed to provide them with the resources they needed, including Bell’s equipment while he was participating in sports at school. Bell attended Groveport Madison High School in Groveport, Ohio, where he was known for his strong achievements in football, basketball, and track. During his high school football career as a running back, he rushed for 3,222 yards and 43 touchdowns, and was selected first-team All-Ohio Capital Conference (OCC) Ohio Division as a senior. It was also during his senior year that he was offered a scholarship to play at Michigan State. He was considered only a two star recruit, ranked 211th for running backs in the nation in 2010. Ended his college career ranked 6th among MSU’s all-time leaders in rushing touchdowns, with 33 in 40 career games. He also ranked 6th for rushing attempts, 7th for rushing yards, and 9th for all-purpose yards, and had 12 career 100 yard rushing games. Bell was named Offensive Player of the Game in the 2012 Buffalo Wild Wings Bowl. His college highlights video is available online. In the 2013 NFL Draft Combine, Bell was selected by the Pittsburgh Steelers as the 48th pick in the second round of the NFL Draft. His 40 time was 4.6 seconds, and he had a vertical leap of 31.5 inches. His complete draft profile can be viewed here. On September 29, 2013, Bell played in his first career game, after having missed the first three weeks of the season due to a foot injury. He finished his rookie season with 244 carries, 860 rushing yards, eight rushing touchdowns, and started the last final thirteen games of the season. In 2014, Bell became the first running back in Steelers’ history to have seven consecutive games with 100 yards from scrimmage. Later in the season, he would tie Walter Payton for most consecutive games with 200+ yards from scrimmage. On December 29, 2014, Bell injured his knee while playing against the Cincinnati Bengals, causing him to miss playing in the Wild Card round of the 2014 playoffs. However, he finished the season second in rushing yards, yards from scrimmage, and all-purpose yards, and leading all running backs in receiving yards per reception. Bell was suspended by the NFL for the first four games of the 2015 regular season after having been arrest in August 2014 on DUI and possession of marijuana charges; however, this was later reduced to three games, and then later to only two games. He made his season debut on September 27, 2015 against the St. Louis Rams. During Week 6, Bell rushed a season high 24 times, finishing the game with 88 rushing yards against the Arizona Cardinals. During the second quarter, against the Cincinnati Bengals in November, he suffered a season-ending torn MCL. After undergoing surgery, Bell was able to return for the 2016 offseason, and, despite the injury, was ranked 41st on the NFL Top 100 Players of 2016. During Week 7, bell caught a career-high 10 passes for 68 receiving yards against the New England Patriots, and on December 11, 2016, he broke the Steelers’ record for rushing yards in a game with 236 yards on 38 carries, while scoring three touchdowns against the Buffalo Bills. He was named AFC Offensive Player of the Week in Week 14, and named to his second Pro Bowl on December 20, 2016. Despite missing four of sixteen games, Bell finished 3rd in the NFL with 1,884 yards from scrimmage. His 2016 season highlights video is available online. Bell is also a rap musician, making his music available through his SoundCloud page (https://soundcloud.com/juicewetrust). He also works actively with several charities, including doing work with PETA. Bell is very active on social media, posting consist updates regarding his career and person life. His Twitter and Instagram handles are @L_Bell26 and @SteelerRB26, respectively. Bell is also active on Snapchat and Facebook. Bell is currently signed to a four year rookie contract with the Pittsburgh Steelers, worth $4.12 million, including $2.27 million guaranteed, and a signing bonus of $1.37 million. His annual average salary is $1.03 million. His jersey and autograph are available for sale on the NFL shop.